We like sushi but had never made it ourselves until now. The strips of seaweed came from Japan but all the other ingredients were bought from a local supermarket. 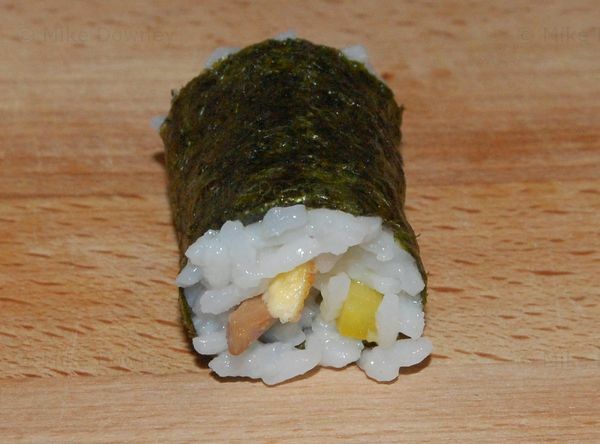 To make sushi for 2, boil 150g of sushi rice until it becomes soft, then strain and rinse with cold water. When the rice has cooled, dissolve some sugar and a little salt in rice vinegar and mix into the rice. 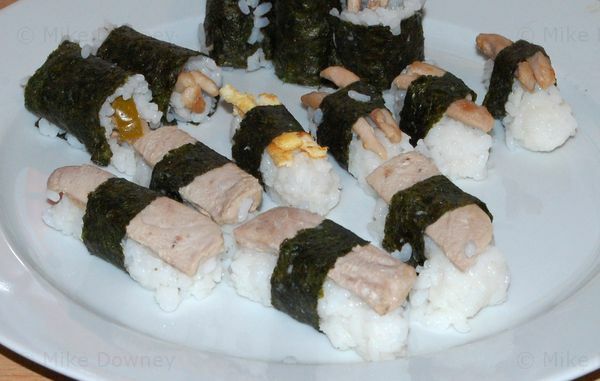 For the rolls we put a sheet of seaweed on some foil, put a thin layer of rice on the seaweed followed by a few strips of tuna, chicken, omelette or vegetable. We used the foil to help roll the seaweed. Serve with soy sauce, wasabi or picked ginger. We don't have access to guaranteed fresh tuna to make sashimi-style sushi so we sliced and fried it first. Obviously the chicken was also cooked too. Different rolls had various combinations of vegetables, which included cucumber, yellow pepper and pickled chilli.